Located just west of Denver, Colorado, Jefferson County is home to roughly 575,000 people. Its public health department’s mission is to promote and protect health across the lifespan through prevention, education, and partnership. As the epidemiology and program manager at Jefferson County, Kelly Keenan’s responsibilities include overseeing the Community Health Needs Assessment (CHNA) and Community Health Improvement Plan (CHIP) processes. These detailed documents report local health and demographic data, helping the department and stakeholders prioritize resources toward best serving its community. Before using LiveStories, Jefferson County struggled to communicate their most recent data. Keenan said, “We had this challenge of how to communicate that the data has been updated to ensure people are citing and using the most recent information.” Keenan recalled that by the time they had printed out their community health assessment and handed it out, some of the data was outdated. Keenan and her team were first introduced to LiveStories after their epidemiologist recommended it. They had three main needs: show the story behind the data, show the data, and update the data easily and on a regular basis. They signed on in 2017 after feeling LiveStories was a good fit for these needs and was easy to understand. In July 2018, Keenan and her team used LiveStories to publish their Community Health Needs Assessment (CHNA). To complete this task, they partnered with two nonprofit hospitals. 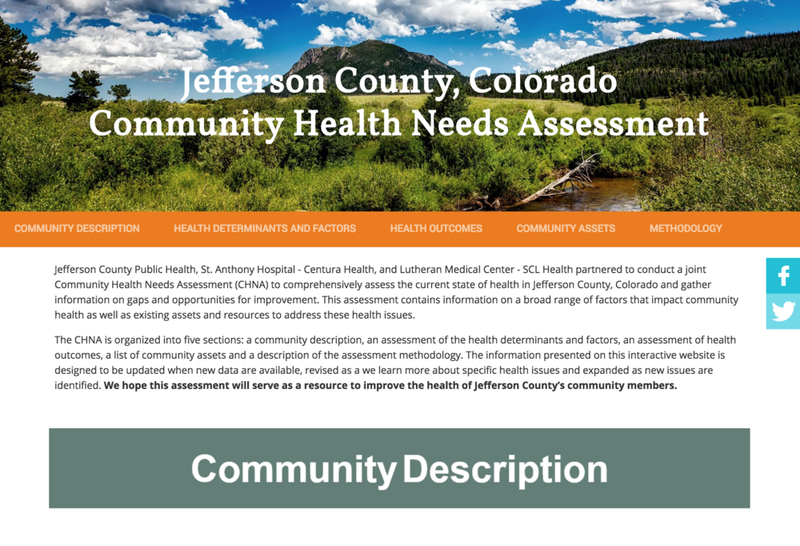 On LiveStories, Jefferson County’s CHNA takes the form of a microsite, with interlinked web pages devoted to various health topics and interactive charts and graphs. Keenan’s team could still print the CHNA from LiveStories as a PDF for regulatory purposes, but LiveStories also enabled them to quickly and easily update the text, data, and charts. Keenan and her team loved having the ability to edit their CHNA. “We are excited about having this as a living assessment we can update. If somebody finds a typo we can fix it so we aren't married to that typo.” In addition to catching typos, they plan to review the content on each page annually, and having their epidemiologist make sure all of the data is as up-to-date as possible. Since their CHNA went live, Keenan says she has received a lot of positive feedback both internally and externally. Internally, the CHNA is making a positive impact by giving them one place to direct folks. Learn how your community can get a modern CHNA with LiveStories. Older PostWhat factors correlate with suicide rates?